Even though it’s not medicinal, a great remedy for the soul is a good weekend away. As Canadians, we’re incredibly fortunate to be surrounded by so many beautiful sights and attractions — many of which are only a short car ride away. Now that the warmer weather is finally on the horizon, there’s no better time than the present to start planning a weekend road trip to one of the country’s many amazing destinations. Whether you’re looking for a quick day trip or a full weekend adventure, we’ve rounded up 20 amazing weekend road trip destinations from a number of the major Canadian provinces for you to enjoy this spring and summer. But before you start rolling down your windows and setting out on the open road, there are a few essentials that you need to make sure to bring. • Water: You never know how long you might be stuck in your car, so it’s important to have plenty of water on hand for those long stretches when there aren’t any gas stations in sight to stock up. •	Snacks: When packing road trip snacks, make sure to pack foods that are crumb-free and non-greasy to ensure you arrive at your final destination looking your best and not covered in chip grease. •	Blanket: You’ll appreciate having a cozy blanket on hand, especially during those long stretches of road when you feel like taking a quick nap. Not to mention a spare blanket will come in handy and be comforting if something goes wrong. •	Medical Emergency Kit: To ensure you’re prepared for any aches and scrapes, make sure to pack a medical emergency kit filled with items like anti-bacterial cream, sunscreen, pain relievers, and plenty of bandages. •	Travel Nausea Medication: There’s nothing worse than getting onto the open road only to discover that someone is feeling carsick. Avoid having to pull over for a sick passenger by stocking up on travel nausea medication. Now that you’ve packed up the essentials, it’s time to cue your favourite playlist and hit the highway and head to one of these incredible road trip destinations. 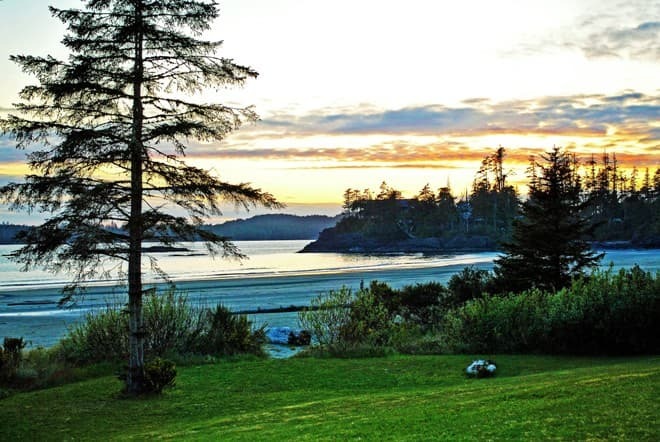 If you’re looking for a breath-taking, seaside escape on the west coast, Tofino is the place to be. Tofino is without a doubt, one of the top places in the country for those looking for both r&r (rest and relaxation) and adventure! From the surfing and hiking to the sunsets, spas, seafood and breweries, Tofino needs to be at the top of your road trip bucket list. For those looking to retreat from the hustle and bustle of the city for some serious unwinding time, the Sunshine Coast is the perfect weekend escape. Here you’ll find scenic coastlines, lush forests, tranquil islands and charming beachside communities like Gibsons, Sechelt, and Pender Island. Known for its signature motto, “Canada’s Warmest Welcome,” Osoyoos is a beautiful and charming vacation town in the Okanagan Valley. Here you can check out the local shops, boutiques and galleries, and enjoy wine from some of the country’s best wineries. Easily one of the coolest villages in the world, Whistler is the perfect destination for a quick getaway for those looking to retreat to the great outdoors. The Sea-To-Sky Highway takes you through one of the most scenic drives in B.C., and hosts plenty of spots for scenic photo ops. While Whistler is known for its immaculate skiing and snowboarding and winter activities, if you happen to visit during the warmer seasons, you can enjoy plenty of outdoor activities, from mountain biking to rock climbing to white water rafting and bungee jumping. Looking to have a more low-key visit? Whistler also has a wide selection of shopping options, spas, and numerous top-rated restaurants. A weekend in Victoria, the province’s capital, will be nothing short of amazing. From the beautiful scenery, hip restaurants and cafes to the impeccable local shopping and picturesque historic landmarks, quiet Victoria is the perfect spot for a cool Northwest getaway. 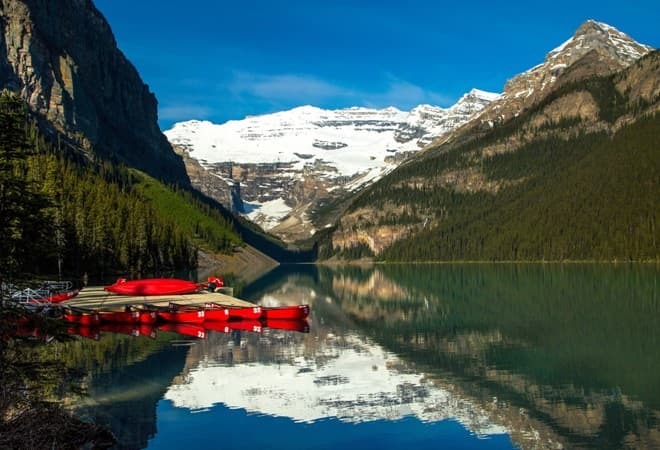 Known for its iconic turquoise waters in the summer and for transforming into a snow-covered wonderland in the winter, Lake Louise is the perfect weekend getaway year round. During the warmer months, there’s enough hiking in the area to keep you busy for weeks, while in the winter, there’s plenty to do from snowshoeing to skating and even horse-drawn sleigh rides. We recommend staying at Num-Ti-Jah Lodge on Bow Lake for some of the best of the lake and glaciers. If one thing’s for certain, the Icefields Parkway is one of Canada’s national treasures and most rewarding destinations. Stretching 232 km, the Icefields Parkway is surrounded by vast wilderness, picturesque mountainsides, sweeping valleys, and photo-worthy glaciers. This amazing travel route will make its way through two national parks and is filled with natural beauty that is second to none. Located near the town of Drumheller, the Dinosaur Trail hosts some of the most spectacular barren scenery you’ll ever see. This is the perfect getaway from those looking to embrace some ancient history, as you’ll be able to see the badlands where some of the most well known dinosaurs roamed millions of years ago. Waterton is a place of natural wonder and is where the mountains meet the prairies. Spanning 505 square kilometres of rugged wilderness and picturesque mountain and lake views, Waterton Lakes National Park is the ideal retreat for nature lovers. You’ll most likely spend your weekend hiking, canoeing, and animal watching — as the park is home to more than 60 species of mammals that include grizzly bears, black bears, wolves, coyotes, and cougars. A 35-minute drive from downtown Calgary, Glenbow Ranch is an incredibly beautiful piece of land that overlooks the Bow River. With more than 25 kilometres of paved trails, gently rolling hills and mesmerizing prairie sky views, this destination is worth the drive. 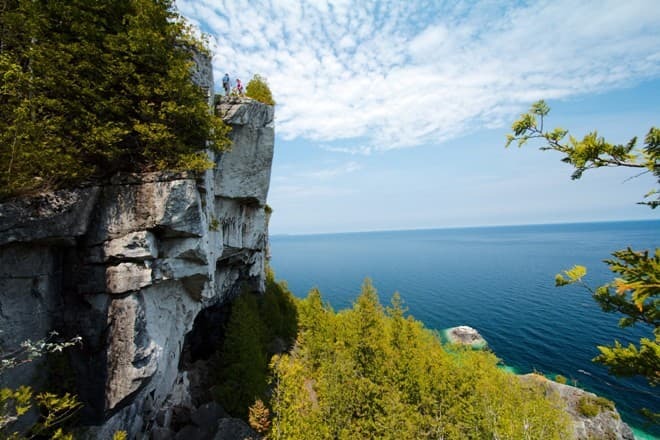 For those looking to embark on a more scenic drive, we recommend heading to the Bruce Peninsula, which is known for its crystal-clear turquoise waters, sandy beaches, and picturesque shorelines. Here you’ll find everything you need for a perfect weekend away, from beaches and lighthouses to national parks and grottos to art galleries and incredible dining options and so much more. Easily one of the province’s most popular provincial parks, Algonquin is known for its picturesque beauty, wildlife, lush forests, and for its camping, canoeing, and hiking — making it a popular destination for those wanting to get in touch with nature. Known for its impressive list of wineries, galleries, spas and fine dining options, Niagara-On-The-Lake is the perfect weekend escape for those looking for a quick escape from the city. It’s also a short drive to one of the most stunning natural attractions in the world (Niagara Falls) for those interested in taking in some sights. If you’ve visited the wineries in Niagara before and you’re looking for an incredible alternative, look no further than Prince Edward County. Located just over two hours east of Toronto, PEC is home to over 40 wineries and breathtaking lakeshore views. Here you can enjoy wineries as far as the eye can see, incredible shops and galleries, stunning scenery and an impressive restaurant scene, which is why PEC has officially become the must-hit road-trip for those looking for a weekend escape. It goes without saying that Muskoka is always a good idea and easily the most popular vacation spot in the warmer months. If the pristine lakes and rolling hillsides weren’t enough to lure you in for a weekend escape, the countless festivals, concerts, farmers markets and outdoor events definitely add to Muskoka’s charm. 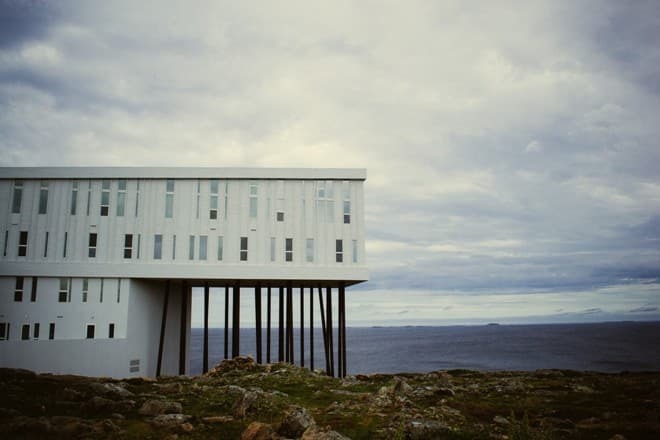 If you’re looking to escape the distractions and stress of your everyday life, head to the very edge of the earth to Fogo Island. This is a place where you'll encounter breathtaking natural beauty along the shores of Iceberg Alley and you’ll instantly lose your troubles upon arrival. Visitors will enjoy exploring the many charming communities, dining on fresh local seafood, and meeting the friendly locals. The Irish Loop is 312 kilometres of absolute beauty. The drive begins in St. John’s and makes its way south along Routes 90 and 1, allowing drivers to stop to check out the unique food, scenery and music along the way. As you drive along the coast, make sure to keep your eyes peeled for the whales, caribou, moose and other wild animals that live in the area. At this stunning east coast national park, which just so happens to be the second biggest in Atlantic Canada, you’ll be surrounded by tiny seaside communities, encompassing forests, vast wildlife, striking shorelines and plenty of photo opportunities. Located just over four hours from central Newfoundland, this is a must-visit destination for those looking for a more adventurous seaside escape. Not only will you get to experience some of the seaside views the country has to offer, you’ll get to be where the sun rises first in all of Canada. The Avalon Region has something to offer for every traveler, from natural wonders like icebergs and wildlife to a bustling urban centre full of music, art, quirky architecture gathered along its coast. Known for its historical architecture, friendliness, and steadfast authenticity, Trinity is the perfect destination to immerse yourself in Newfoundland and Labrador history. From the beautifully restored fishing rooms and saltbox houses to the charming locals and impeccable seafood, Trinity will quickly become your new favourite Canadian escape.